This content was presented by Becky Livingston at the NJ Governor’s Conference on Volunteerism: The Power of One, corporate track. In her presentation, Becky highlights the 10 Ways Social Media Drives Corporate Volunteerism, Philanthropy, and Community Relations. 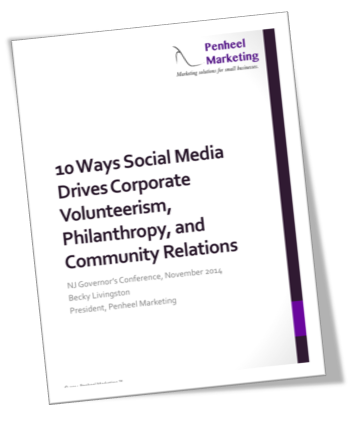 How you can implement a social media effort within your corporate volunteerism program. Additionally, Becky referenced these resources during her presentation. These items are not included in the download, but may be accessed independently via the links below. Add your email to our email list for tips, tools, and updates?